Maine Gov. 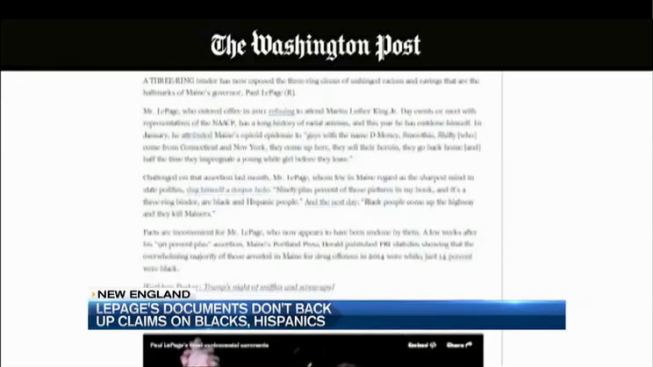 Paul LePage is back in the national spotlight — this time, the Washington Post is calling for his resignation, after the public release of his infamous binder full of drug dealers. In a scathing op-ed, the post calls LePage "unhinged," and criticized him for saying his binder would show 90 percent of drug dealers arrested in Maine were black and Hispanic. LePage's office released the binder's contents this week as part of a Freedom of Information request. The majority of those pictured were white people. LePage's office clarified that the 90 percent figure was about the out-of-state dealers in the binder, adding his administration would like to put the binder controversy behind them. "The bottom line is we need to move past this and we need to seek solutions in this heroin pandemic in our state," said spokesperson Adrienne Bennett. LePage's binder has been widely criticized by Democrat lawmakers and the ACLU of Maine. When Rep. Drew Gattine called his comments "racially charged," the Governor left him a profanity-laced voicemail that received national media attention, and led to calls for his impeachment. Coming to LePage's defense Wednesday was a unlikely candidate: a black reverend and former drug addict. "Whoever among us who does not have racist attitudes in their heart you cast the first stone at LePage," said Rev. Steve Craft, representing the conservative "Constitution Camp," at a press conference in Augusta. Rev. Craft wrote a letter to LePage in August, trying to send him a word of encouragement when the national controversy over his binder and voicemail was at its height. "As a former heroin addict, I can testify that everything you say in regard to drug dealers and addicts is true," his letter stated. Craft said LePage was wrong to cite the race of drug dealers with "skewed" statistics — but said his critics are wrong for "playing the race card."